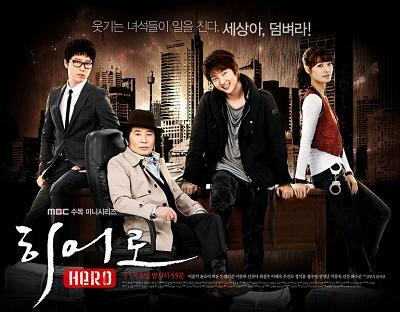 Hero is the story of Korea’s top reporters and ordinary citizens fighting against the society elite’s abuse of power. Jin Do Hyuk is a clever and talented reporter who ends up living a life of recklessness and despair when the woman he loved dies. He later decides to start a new life by helping other victims of society’s crimes, becoming a modern hero who battles against the non-ethical. – Actress Han Ji Min dropped out from the leading role before filming starts to be replaced by actress Kim Min Jung. – Due to a serious shoulder injury, actress Kim Min Jung was forced to leave the production on 31st October, 12 days before the airing date. and replaced by Yoon So Yi. This entry was posted on Sunday, February 5th, 2012 at 7:59 AM	and tagged with baek yoon shik, lee joon ki, uhm ki joon, yoon so yi and posted in 720p, Drama, Waiting To Be Watched. You can follow any responses to this entry through the RSS 2.0 feed.